QuiBids just so happened to hit two separate and not-directly-related milestones yesterday. First was our third year of business, which we celebrated with a free shipping promotion over the weekend. The second was even more colossal in stature — we resolved our one millionth Customer Support ticket through Zendesk! Our Customer Support team is one of the best and most determined in the business, and Sara Howell’s a big reason why. She’s one of our Customer Support Managers who work directly with both customers and Customer Support specialists every day to help ensure that your experience with QuiBids runs as smoothly as possible. Her work’s been recognized by her peers and she’s made it as QuiBids’ Above and Beyond Manager for the month of October! Take a few minutes to get to know her by reading the interview below and feel free to say congratulations down in the comment section. 1. How (and when) did you get your start at QuiBids? 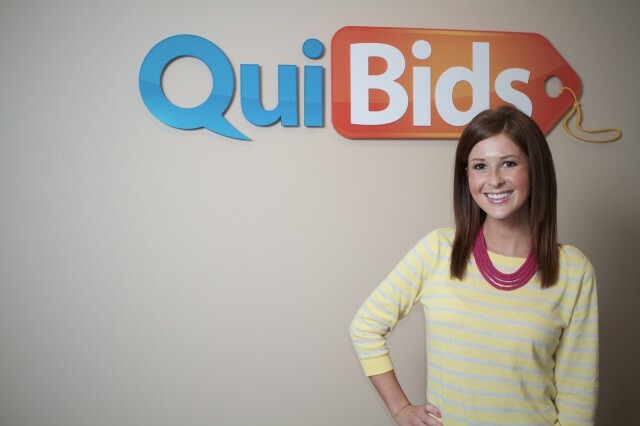 I started at QuiBids in March of 2010. My brother-in-law is friends with a couple of the execs, who had mentioned they were looking to hire some new employees. My interview was pretty bizarre. I walked into a small room filled with inflatable monkeys and palm trees. I sat down in a chair, which smashed up against Shaun [Tilford, our company’s Chief Technology Officer]’s desk while he was trying to pretend an interview wasn’t taking place right behind him. In walked the CEO, COO, and director of Customer Support, and we were CRAMMED in this room. I’m talking knees almost touching. So of course I turned probably 20 shades of red because I was so nervous. I guess I somehow impressed them all and landed the gig! QuiBids sure has changed a lot since then! 2. What’s the best prank you’ve pulled in the office and/or somebody’s pulled on you? One April Fool’s Day, two of my employees decided they would pull a little prank on me. One of them told me to monitor a phone call because we had an angry customer on the line. I picked up the phone to hear an employee totally losing it and cussing/yelling at a “customer.” Pretty sure I stopped breathing for a few seconds. I thought I was going to have to fire an employee for the first time. Turns out, the “customer” was another employee, who had called in from a blocked number. The two employees still work at QuiBids — they better watch their backs. 3. What’s the last book you read, movie you watched, and song you listened to? 4. What’s a work-related accomplishment that you’re particularly proud of? 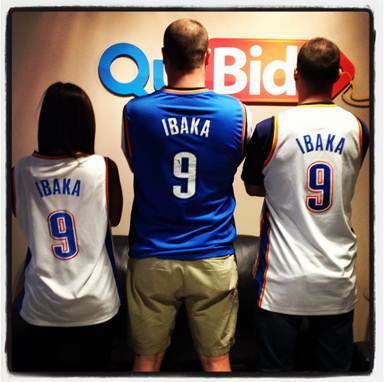 A couple years ago, our CEO, Matt, thought it would be a good idea to test out some new faces on QuiBids marketing ads. After a couple snapshots, we realized I am extremely awkward in front of the camera. They gave my ads a shot anyway, and I’m happy to announce I had the worst conversion rates in QuiBids history! All jokes aside, I am very proud that I have received both the Outstanding Employee and Outstanding Manager awards. 5. Favorite member of the Oklahoma City Thunder? Serge Ibaka. He’s a favorite here at QB. But I seriously love them all, they make my heart melt. 6. From a CS manager’s perspective, fill in the blank: The best employees are the ones who ____________. Follow guidelines while always keeping the customer’s best interest in mind. 7. Who’s the least likely to survive if the Customer Support office gets trapped on a desert island? This is a tough one. Send us to an island and let’s find out! 8. What’s your biggest online distraction at work? Buzzfeed. My personal favorite is 50 People You Wish You Knew in Real Life. 9. Your boss tells you shortly before lunch to take the rest of the day off. What do you go do? Sit on the couch and watch as many episodes of Pretty Little Liars as possible. And probably bake some cookies or cupcakes. 10. What do you like best about working at QuiBids? It has been amazing to watch this company grow from the ground up. When I started at QuiBids there were about 20 people in the company, and now we have around 150. I’ve really enjoyed the challenge of implementing processes during times of growth. The people here are pretty outstanding as well.